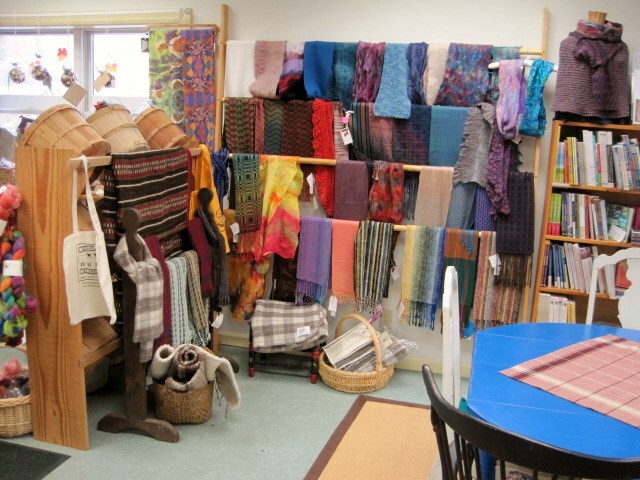 We carry local and regional crafts – mostly fiber arts (wearable scarves, shawls, hats and homewares like blankets, table runners, and hot pads) plus yarns from local farms or hand-dyed by local artists. You’ll also find some interesting gift basket items from local foods to notecards to fiber jewelry. Please see the YARNS page for this information. We have handwoven scarves from 5 different local weavers – all unique, many in Fall and Winter colors (but wear them year-round). We also have shawls (sometimes blankets and throws), table runners, hot pads, placemats, and small rugs. This is a small store with a small selection in some cases (don’t expect 20 colors of placemat sets), but it’s definitely worth a look! I look forward to seeing your shop soon. I would like to register for workshop, Sunday, March 30th 1 to 4 P.M.
I’m sorry, we don’t carry Debbie Bliss yarns. Good luck with your search.